SAN ANTONIO, March 28, 2016 — NewTek™ today announced that Broadcast Minds™, the go-to panel at NAB providing insight from leading voices in the modern digital landscape on the future of broadcast and video communications, is returning for its seventh year at the NAB Show. This year’s event will feature dialogue between experts from industry leading companies including Turner Sports, NBA Entertainment, Simplynew and NewTek. The discussion will be held on Monday, April 18 at the Las Vegas Convention Center X Hall Room S222. Doors open at 4:30 p.m., PDT and the panel discussion will start at 5:00 p.m. 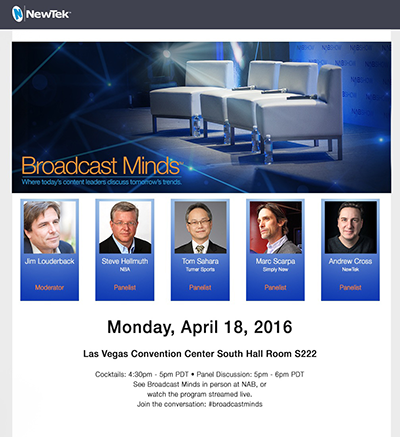 The Broadcast Minds event at the 2016 NAB Show is open to all registered attendees. Those unable to attend can register to watch a live stream of the discussion. Join the conversation at #broadcastminds. Former Broadcast Minds panel participants include Robert Scoble of Rackspace; Sterling Proffer, VICE Media; Tom Green, actor and comedian; Criss Angel, executive producer and director; Cali Lewis, host of GeekBeat TV; Norm MacDonald, writer and producer; Kevin Pollack, award-winning actor and comedian, Jeff Jacobs, MTV/Viacom Music Group; Bill Chapman, Turner Studios; Jeff Hawley, Yamaha Corporation of America; Adam Carolla, award-winning actor and comedian; Mark Fratto, St. John’s University; Peter Himmelman, GRAMMY-nominated musician; Sean Smith, NBA D-League; and Don Sperling, New York Giants.